Get ready for the annual Sheridan Park Yard sale and Sunnyside Mall Art & Music Fest on Saturday, August 1. The Sheridan Park Yard Sale offers bargains galore for savvy shoppers—best place to start is Magnolia and Wilson. American Girl Doll clothing, jewelry and more. Musical entertainment begins at 10:15AM. Food trucks to satisfy your appetite! 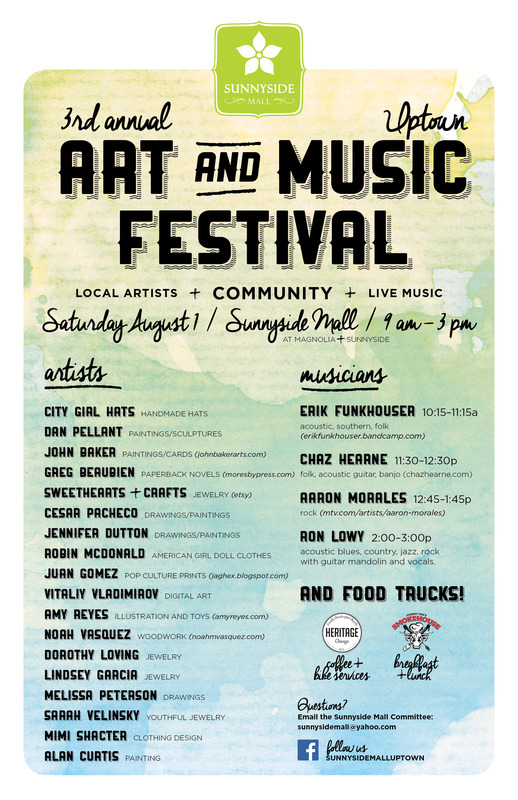 Please share and post the attached Sunnyside Mall Art & Music Fest Poster—help spread the word. Call for volunteers to help with the Sunnyside Mall Art & Music Fest. Sure can use volunteers to assist with early morning set-up and break-down afterwards. IF you can spare a bit of time please send email to sunnysidemall@yahoo.com. The good news is no shooting victims so far in July; bad news is the gang turf-wars and gunfire continue. Middle of night, on July 11, the fools came out with their spray paint to graffiti many of the buildings along the Sunnyside mall. Graffiti was these knuckleheads’ way of honoring one of their boys who had recently been murdered. We suggest the City examines the enormous cost of Graffiti removal and holds these miscreants accountable for cleaning up the Graffiti. On July12, a beautiful Sunday afternoon, around 2:30PM, multiple gunshots were fired by the Magnolia & Wilson strip mall. A young black male with distinctive corn-row hair with bleached orange tips was seen by a witness escaping the scene. Later that week, a male matching that description was arrested for a Rogers Park murder. § 4501-09 N Malden—J & J Properties—200 unit building. Active drug sales from side entrance on Sunnyside. No address on door. ü If you see something, do something—call 911 and report criminal activity, then call/text your 911 group members. Give details and your name. ü Attend CAPS or have someone from your 911 call group attend and report what’s happening. Request follow-up report at next CAPS meeting. GWNA has a representative at all CAPS meetings. ü IF you see continued suspicious activity occurring at/around a property—note address and property management info and along with 911 calls, report at CAPS. Criminal/nuisance housing laws do apply—the State’s Attorney can prosecute property owners whose properties are determined to be criminal housing. ü JOIN your block club, JOIN your block club: GWNA next newsletter will include special building membership offer—sign up for newsletter now, visit www.uptownupdate.com for information on how to join Beacon Block Club, Dover Street Bock Club and Magnolia Malden Block Club. ü Keep informed: Read DNA Info, Every Block, Uptown Update, Facebook Pages of your block clubs and Crime in Boystown. This decision to spend menu money was made without community/public input. One of the cameras is slated to be installed at the Sunnyside Mall by Malden. We believe the community deserves a voice in this decision. Would it not be wiser to hold the nearby Malden property managers responsible for making public safety improvements to their properties/tenants and use the menu money towards Sunnyside Mall improvements that make the mall a safe and welcoming place? Never doubt that a small group of committed citizens can change the world.